The changes that helped grow more food led to excessive use of fertiliser, says S.Ananthanarayanan. Modern ways of agriculture held out a promise of unlimited food to feed growing populations. The boom in produce was mainly through high-yielding varieties and massive input of artificial fertiliser. Of fertilisers, however, both production and the run-off, from fields, are proving an environment hazard, which would negate the value of the food produced. Shan Li, YonghangTian, Kun Wu, Yafeng Ye, Jianping Yu, Jianqing Zhang, Qian Liu, MengyunHu3, Hui Li, Yiping Tong,Nicholas P. Harberd and Xiangdong Fu, from the Chinese Academy of Sciences, Beijing, Hebei Academy of Agriculture and Forestry Sciences, Shijashuang, China and the University of Oxford, report in the journal, Nature, that there is a relationship between the genetic factors that help a food plant stay short in stature, which helps stability of the plant and its output, and how efficiently the plant assimilates nitrogen from fertilizer. Tinkering with the genetic factors then enables plants to stay short in stature, but still use fertilizer efficiently. “The green revolution of the 1960s boosted crop yields, and was partly driven by widespread adoption of semi-dwarf green revolution varieties of cereals”, the Nature paper says. The paper explains that semi-dwarfism reduces the flattening of plants by wind and rain, an effect called ‘lodging’, which reduces the grain yield of plants. Semi-dwarfism in plants is because of the growth suppressing protein, DELLA. As plants need to grow, normal plants have a factor, GA, which suppresses DELLA. In semi-dwarf and high yielding plants, DELLA is either resistant to GA or there is low production of GA, the paper says. In both cases, DELLA is able to accumulate and the plant stays short. Keeping the height of the plant low is also helped by the plant being relatively insensitive to nitrogen. DELLA has the effect of reducing the plants’ growth response to nitrogen. However, “nitrogen allocation to grain continues,” the paper says. With low nitrogen intake in hybrid plants, there is a need to increase the quantity of fertilizer use, so that supply of nitrogen for grain production is not affected. Fertiliser use, however, damages the environment. The production, both in the form of ammonium salts, which are used in anaerobic crops, like rice, or nitrites, which are used with aerobic crops, like wheat, need huge energy for production. This is because ordinary nitrogen, which is abundant in the atmosphere, is of no use for vegetation. Ordinary nitrogen is the molecular form, which is exceedingly stable, a leader among inert substances and difficult for plants to use. Useful nitrogen, which is found in fertilizers, is the reactive, ‘active’ kind and it takes energy to prise the nitrogen molecule apart. This apart, most of the fertilizer that is used is not absorbed by the plant and waste irrigation water contaminates water bodies. “Development of new Green Revolution Varieties that combine high yields with reduced nitrogen supply is thus an urgent goal for global sustainable agriculture,” authors of the paper say. They hence set out to analyse how these plants integrated the priorities – low stature, plentiful grain production and low nitrogen inputs. 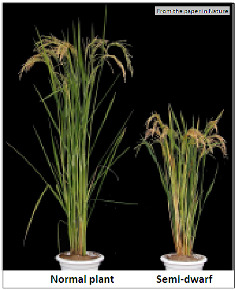 A survey of different existing and cross-bred rice varieties and analyses of their genetic composition revealed that the intake of the nitrogen-rich ammonium ion, as well as growth, in response to nitrogen supply, was regulated by the protein, GRF4. GRF4 thus counteracts the growth-repressive effect of the DELLA protein. The group next examined the way that the GRF4 - DELLA protein interaction affected the food producing mechanism, of plants fixing carbon from the air in the presence of sunlight. While GRF4 was found to promote the genes that help photosynthesis, and the DELLA protein restrained them, it was seen that semi-dwarf, green revolution varieties did have higher rates of photosynthesis. 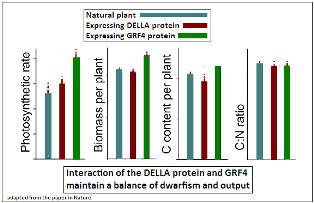 The effect of DELLA to suppress growth was reversed, and more, in varieties with GFR4, while keeping the uptake of carbon and nitrogen in the same balance. And finally, it was seen that GFR4 had the effect of increasing grain yield and the efficiency of nitrogen use. Although long thought to exist,” the paper says, the study has shown the working of GRF4, which regulates multiple nitrogen metabolism genes, with a self-regulating, nitrogen sensitive, feedback mechanism. With an antagonistic relationship with DELLA, a growth repressor, there comes into being a coordinated regulation of plant growth and metabolism, the paper says. And then, “increasing the abundance of GRF4 in green revolution varieties tips the GRF4–DELLA balance to favour GRF4, conferring increases in carbon and nitrogen assimilation, biomass, leaf and stem width, but having little effect on plant height. The practical plant breeding consequence of this is that it enables plants to assimilate nutrients without the loss of the beneficial semi-dwarfism conferred by DELLA accumulation. Nitrogen use economy can thus be improved, without the yield penalties of increased lodging,” the paper says.